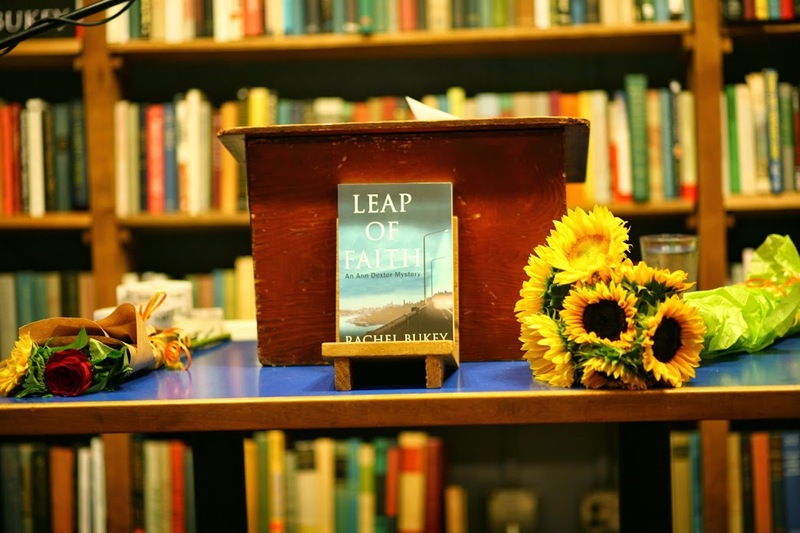 Just over a week ago I launched my first mystery novel, Leap of Faith, at The Elliott Bay Book Company in Seattle and I’m just now coming down off the high of that awesome dream-come-true experience. Here’s how it played out. I invited all my friends to come and help me celebrate the publishing of my first mystery novel and everyone showed up! And friends brought other friends. One friend of mine brought his mother, wife, daughter and his daughter’s friend. Wow! I greeted people and watched nervously as more and more chairs were lined up in the room— we packed the house! There were introductions and then my publisher, Waverly Fitzgerald of Rat City Publishing, raffled off tickets to a Rat City Roller Girl bout – tickets collected by a member of the Junior Roller Girl “Brats” rolling around the room on skates. Finally I got up on the podium and faced the crowd. I’d been nervous all day. I’m not used to public speaking. Having spent some years teaching middle school language arts and writing, I’m especially not used to getting up in front of a group and having their immediate attention. It felt like an out of body experience. But once I looked around the room at all the smiling and expectant faces of my family and friends, I could really feel the love. That sounds corny but it’s exactly what I felt – love and good wishes for my success beaming from every person in that room. My nerves settled then and I was able to give a brief introduction about writing mysteries in general and about the Ann Dexter series in particular. I read the Prologue and first chapter of Leap of Faith. There were some questions: Why did I decide to write about a psychic medium? Why did I choose to set the mystery in Seattle? Was I thinking of a particular suicide I had witnessed off the Aurora Avenue Bridge? Would I be going on a book tour? And after the Q & A I made my way to the back of the room to sign books. That’s when I really felt strange. I mean, real authors do this, right? And my nerves flared up again. I faced the first person in line and my mind went blank – his name would simply not come to me. I couldn’t remember his name! 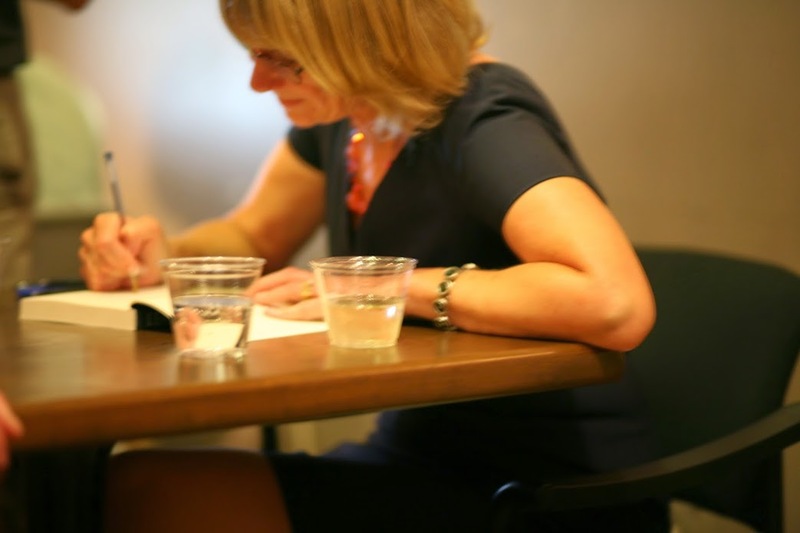 One of my writer friends had told me about a book signing where the author provided sticky notes for those in line and on the white board had written: “Even if I’ve known you since kindergarten, please write your name down in case my mind goes blank.” I should have heeded that warning. But Andy just chuckled and reminded me of his name. He’s a writer too and I think, I hope, he understood about nerves. 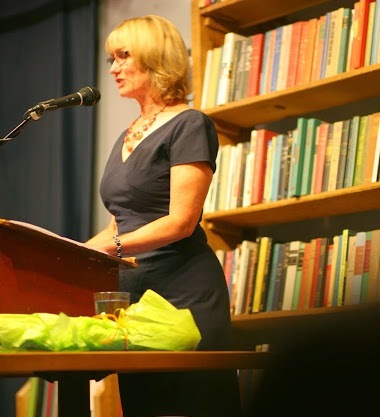 And here’s another fabulous thing that happened that night: the book sold out! 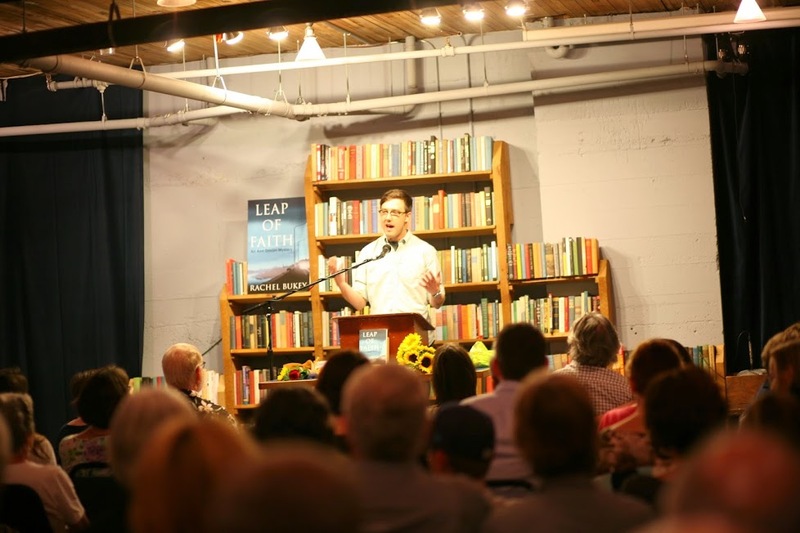 The common wisdom is that only about fifty percent of those invited will actually show up at a book launch so Elliott Bay ordered books accordingly. Ha! I guess they didn’t know that I have the best friends and family in the world. You all packed the house and rocked my universe that night! I had a lovely experience sending Leap of Faith out into the world. Thanks to everyone! 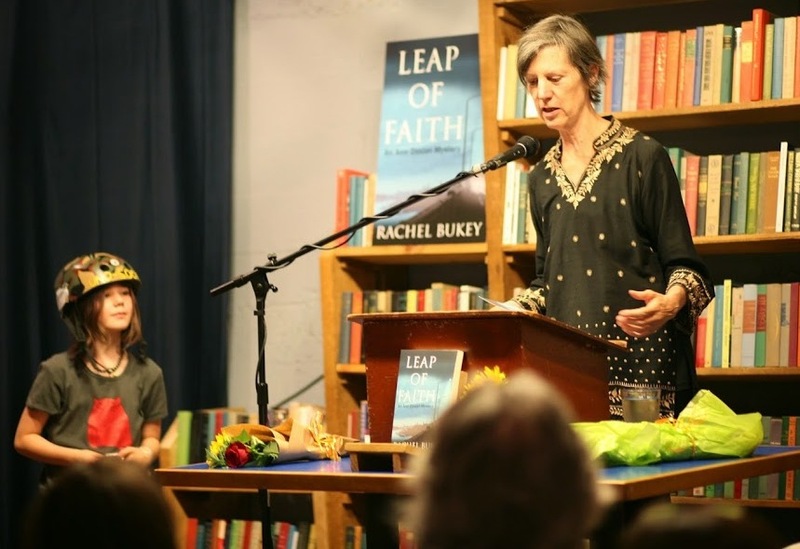 This entry was posted in Rachel Bukey about writing, Rachel Bukey writings and tagged book launch, Elliott Bay Book Company, Leap of Faith, Rat City Publishing. Bookmark the permalink. 2 Responses to Book Launch Celebration! The heck with reading Leap of Faith — when will Don Giovanni’s Hell be out! Rachel, you are going to have to put aside everything else now to start cranking out Ann Dexter mysteries to satisfy your fans!